The new State of Hawaii’s new Diamond Head Hiking Narrated Tour is recommended to all visitors planning to hike to the Diamond Head summit, just $4.00 per person. Tour includes the State of Hawaii official "I Hiked Diamond Head" certificate at $2.50 value! Comes in English, Spanish, Japanese, French, German, Korean, or Chinese [Mandarin]. The new State of Hawaii’s Diamond Head Hiking Audio Tour is recommended to all visitors planning to hike to the Diamond Head summit. This incredible self-guided audio tour will provide you an enriching Diamond Head experience. Don’t just hike; get an insider Diamond Head Tour you will never forget! Comes in English, Spanish, Japanese, French, German, Korean, or Chinese [Mandarin]. Retail just $4.00 and the tour includes the official State of Hawaii “I Hiked Diamond Head” certificate, a $2.50 value! Last year over 1,000,000 visitors hiked Diamond Head making it Oahu’s 3rd largest visitor attraction. Diamond Head Visitor Center does not offer escorted tours of the hike; this hiking audio tour is the official Diamond Head tour offered by the State of Hawaii & Pacific Historic Parks. Diamond Head State Monument is one of Hawaii’s most recognized landmarks and for decades, visitors have hiked to the summit of Diamond Head to enjoy the breathtaking views of Oahu. Diamond Head State Monument is maintained by Hawaii’s State Parks and is a popular historic trail that offers a memorable Hawaiian adventure for the entire family. Diamond Head crater is just minutes from Waikiki. This incredible self–guided audio tour comes with a four color souvenir map guide and focuses on the history, legends, culture, geography, plant & animal life, music and scenery of the Diamond Head State Monument. Learn how the ancient Hawaii’s considered Diamond Head a sacred location and how the US Military used Diamond Head for their first line of defense on protecting Oahu southern shores during World War II. This great tour is like having your own State Park Ranger provide a great narrated tour on your hike that is both fun and informative! 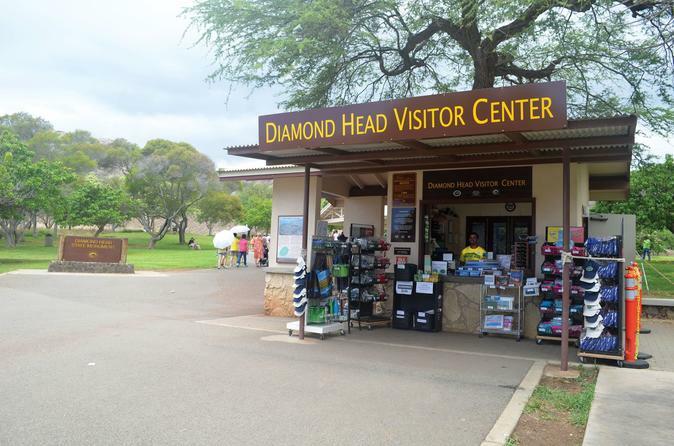 Please check in with your Viator voucher at the Diamond Head Visitor Center, located in the Diamond Head crater. (Sorry, no phone check-ins). Check in at the Diamond Head Visitor Center, the only location in Hawaii that offers the State of Hawaii’s exclusive Diamond Head logo merchandise. This is considered a “moderate 1.6 mile hike” be sure to dress casually; with comfortable shoes, shorts, hats and sun tan lotion. We do not recommend that you start your hike from Waikiki. Please take “The Bus”, taxi, a Diamond Head shuttle or a rental car to the Diamond Head crater. There are limited parking spaces within the Diamond Head crater; we recommend you come early from 7am -8am or from 11am on, for the slow traffic times. This Diamond Head Tour does not include the admission/parking fees to get into the Diamond Head crater. Walk in fee is $1.00 and rental cars are just $5.00.